Author and yoga instructor Travis Elliot became known to many through his yoga DVD series, The Ultimate Yogi. That collection of twelve yoga routines consisted of various themed classes, one of which was a 65-minute yin yoga practice. In this book, Elliot builds on the popularity of that particular class by offering a comprehensive approach to the practice of yin yoga. More than just a yoga practice manual, A Journey into Yin Yoga is filled with stories from Elliot's life—starting with the near-fatal car accident that brought him to the practice—as well as featured "Personal Journeys" from various yogis, athletes, and others of note. Elliot opens with a discussion of yoga's history. He provides a brief overviews of classic texts such as the Vedas and the Yoga Sutra. From the latter, Elliot presents the Eight Limbs of Ashtanga Yoga plus the traditional paths of yoga (raja, jnana, karma, bhakti, and hatha). This leads into the origins of yin yoga itself. Elliot recognizes the major founders of yin, including Paulie Zink, Paul Grilley, and Sarah Powers. He also explores the tradition of Taoism, explaining how the principles of chi, yin and yang, and the five elements have contributed to yin yoga. Elliot delves deeper into yoga philosophy via a review of the subtle body. Readers may find this section—which covers koshas, prana vayus, gunas, and chakras— somewhat esoteric. In Chapter 4, Elliot turns to the science behind yin yoga. He reviews the important anatomy involved, starting at the cellular level and moving through connective tissue, tendons, ligaments, bones, cartilage, joints, and fascia. He also addresses the nervous system, particularly emphasizing how the restorative parasympathetic nervous system, the main system activated via yin yoga, benefits stress and overall health. The yin yoga poses themselves are presented in the fifth chapter. There are 46 total postures included, with each one featured in a 1-2 page layout accompanied by clear, full-color photos as well as details on suggested duration, benefits, risks and contraindications, alignment points, and modifications. In addition to the yin postures, six additional poses are presented as counter-stretches, poses held for shorter periods of time between the yin poses. Sequences to organize the yin postures are offered, but these do not appear until Chapter 7, "Developing a Personal Practice." 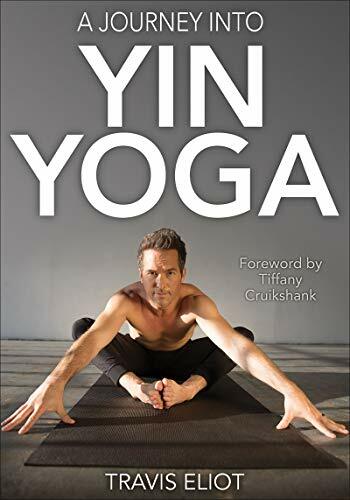 This chapter includes warm-up or more "yang" activities, which is odd because yin is traditionally practiced without warming up, allowing for more specifically targeting the connective tissue rather than the muscles (which will take over once warm). Furthermore, the presentation of the yang sequences feels cluttered, with 6-10 small photographs squeezed onto a single page supplemented with small text. A total of ten yin routines are described, including practices for sleep, athletes, hips, upper body, and pre-natal. The intervening chapter address breathwork (pranayama) and meditation. Again utilizing full-color photo illustrations, Elliot offers seven different posture options for breathing practices, and he describes eight different types of breathing exercises, or pranayama. Similarly, he reviews eight styles of meditation, although only Loving-Kindness Meditation and Chakra Meditation are explained in more than just a few sentences. The book concludes with "Inspiration and Final Thoughts," which contains Elliot's reflections on subjects from freedom to letting go. A short glossary and bibliography are also included. This book is at its best in the presentation of the yin poses. The depictions are excellent and organized in an understandable, accessible manner. Unfortunately, this is less true of the remainder of the book. Certainly, the information on topics from the origins of yoga to pranayama was accurate and informative, yet it felt out of place in a yin-focused book. Adding to the sense of too much information was the excessive use of testimonials, quotes, and shaded boxes that appeared throughout. I found the shaded asides especially distracting: these were lengthy (most were 2 pages long) and often seemed misplaced (e.g., "Yin Yoga and Pregnancy," which included practice tips for pregnancy, appeared within the chapter on science rather than the one on practice). For those who are new not only to yin yoga but also to the practice of yoga itself, A Journey into Yin Yoga will provide a helpful overview. Yet those who searching for a manual that is more yin-specific may be disappointed. As a yoga teacher who has both practiced and taught yin yoga, I found Elliot's work to be somewhat informative, but it would definitely not be my go-to guide for yin.